These ancient sighthounds were bred for what their name implies: hunting wolves. These enormous, shaggy dogs can put fear in the hearts of their enemies, but they adore their owners and families. 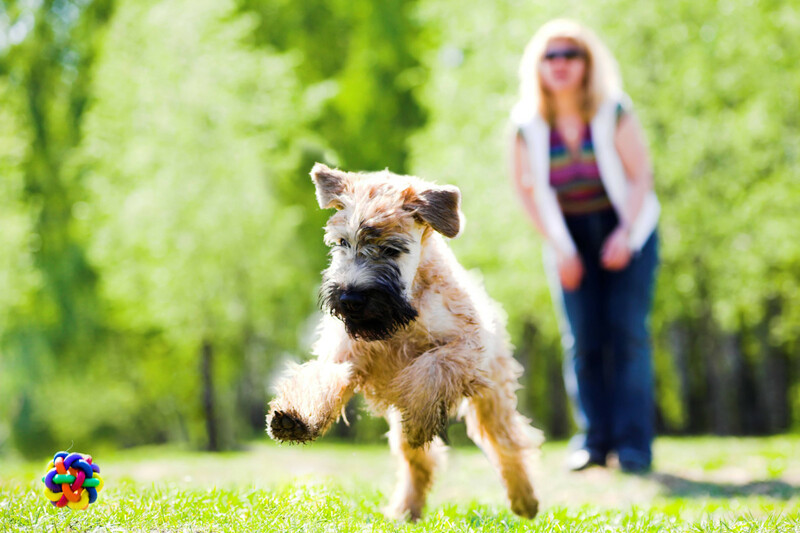 Irish Wolfhounds are thought to be the tallest of all dog breeds, and anyone who’s seen one standing on its hind legs knows it. The following traditional names from Irish mythology are the type of Celtic names that have meaning in Irish culture. 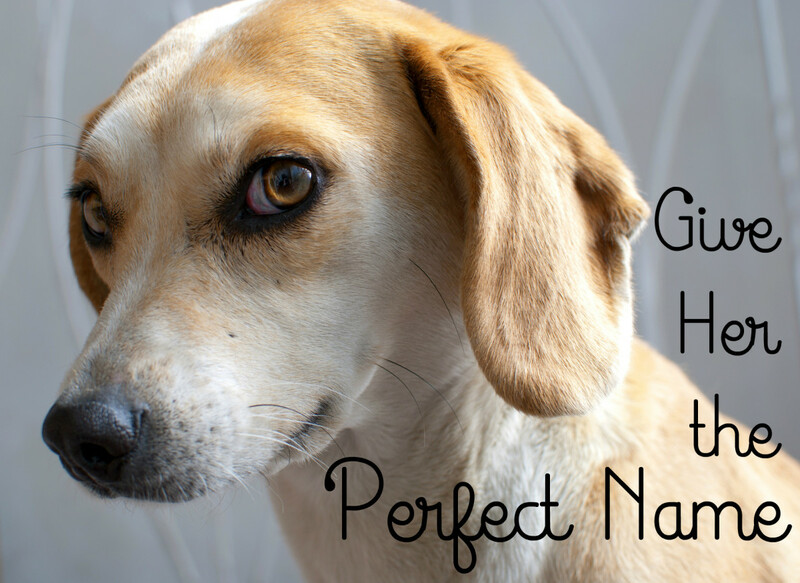 When you give your dog a name with meaning, it can help make the two of you even closer. 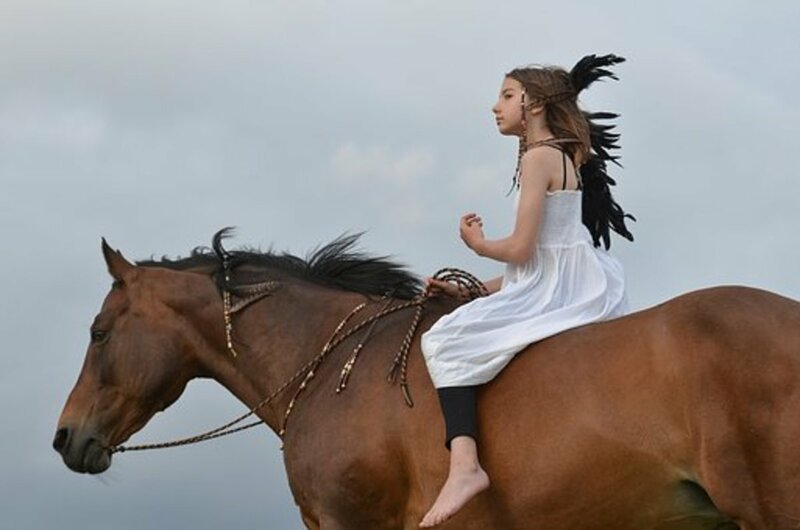 Aengus was a god of love, youth, and poetic inspiration. Traditionally, Aengus has singing birds flying around his head. Aengus owned two powerful magic swords and two magical spears. The name Aengus could be good for most male Irish Wolfhounds, particularly those who are protective of their families towards others, but completely sweet within their families. Aillen “The Burner” lives in Mag Mell, the Underworld. Stories say, Aillen would lull people to sleep at the hills of Tara where mysterious rocky mounds are found. After that, Aillen would burn the whole thing down while the people slept. This name could work for a male Irish Wolfhound with red, black, or grey fur since they can all represent phases of fire. The goddess of wealth, sovereignty, and summer, Áine is associated with midsummer and the sun. Áine’s symbol is often a red mare. Áine is also a goddess of love and fertility. This name could be good for many loving female Irish Wolfhounds, but it would be particularly good for a red Wolfhound as that would reflect Áine’s symbol of a red mare. Balor was the king of the Fomorians. These creatures were either depicted as shaggy, monstrous creatures or beings from the ocean. Balor is often seen as a shaggy, one-eyed creature who is powerful in battle. His eye is said to have special powers that can wreak havoc on his foes. This could be a cool name for any male Wolfhound with their shaggy appearance. It would work particularly well for a Wolfhound who has lost an eye, but it would also work well for any powerful male Wolfhound. Brigid is a dawn goddess whose realm includes spring, fertility, healing, poetry, and smithcraft. Poets have always loved the goddess Brigid. Some believe Brigid was a three-part goddess, all named Brigid, each of whom took one of the major duties she looked over. This name could be a good one for a lot of female Irish Wolfhounds. 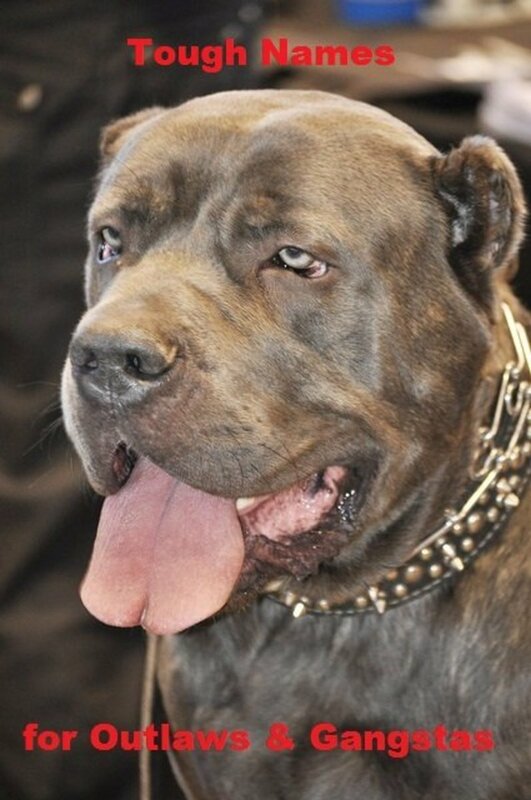 It could be particularly good for a girl who a breeder plans to use in his or her breeding program. Due to Brigid’s ruling over smithcraft, this name might also be nice for a gray or black Wolfhound. Cian’s name means, “long, enduring, far, and distant.” Tales say Cian was betrayed and mortally wounded by the three sons of a rival of his. Cian tried to escape by turning himself into a pig, but it did no good. He was murdered. Cian’s son, Lugh, made the three sons go on a quest to solve a number of tricky tasks to make up for taking his father from him. The tests Lugh set up for them were very hard. The trio was dying by the time they finished the challenges. Despite their father’s desperate pleas, (the father who sent Lugh’s father to death), Lugh did not let the brothers use a magical pigskin they had found during their challenges that had the ability to heal all wounds. So, they all died and their father died of a broken heart. And Cian was avenged. 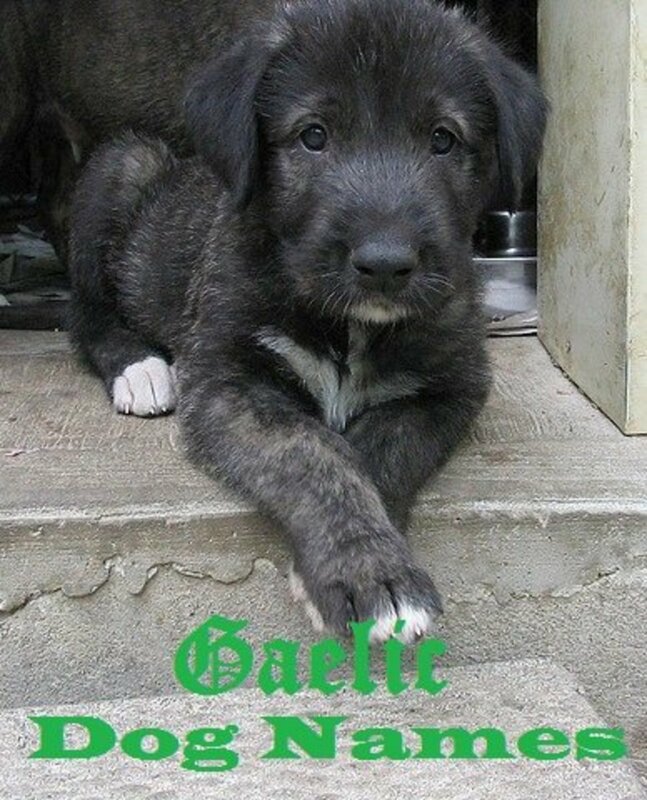 Cian is a name for a male Irish Wolfhound who is honorable, but perhaps a bit gullible. This Fomorian giant lived on Tory Island. He oppressed the people there, demanding tribute from them in goods and children. Eventually, Conand was overthrown for his dastardly ways. Conand could be a good name for any mischievous male Irish Wolfhound who might like being the boss of things a bit too much. Danu is a mother goddess figure who the Victorians also associated with land. She is an expansive figure who cares for others. 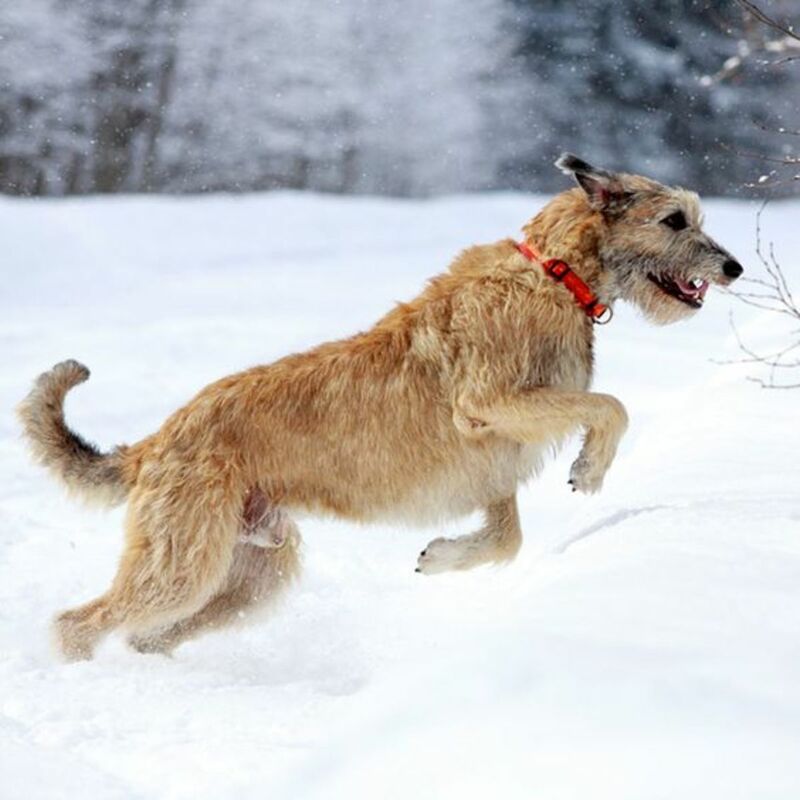 Danu could be a wonderful name for any female Irish Wolfhound who loves to run through the fields. It could also work for a Wolfhound who is a mother or who a breeder plans to use in a breeding program. 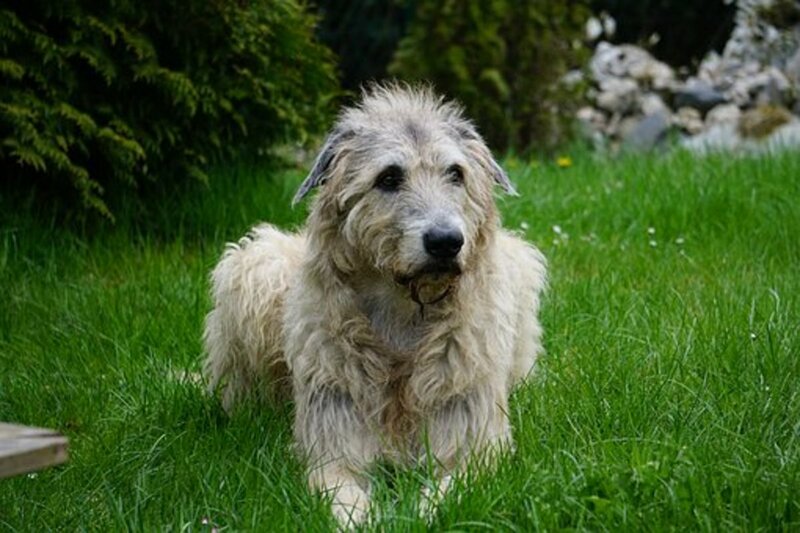 Do You Have an Irish Wolfhound? Known as “Deirdre of the Sorrows,” Deirdre was the daughter of a royal storyteller. Before she was born, prophecy said the great knights of Ulster and other great people would fight for her hand and be driven from the kingdom over her beauty. Some people even urged her father to kill Deirdre at her birth to prevent this great strife. But the king of Ulster was so intrigued at the prospect of Deirdre’s beauty that he took her away and had her raised himself. The king had her raised hidden in the woodlands and planned on marrying her when she was of age. Unfortunately, Deirdre fell in love with a young man named Naoise and they ran off together. Years later, the king tracked Deirdre down. Once his spies discovered Deirdre was still beautiful the king attacked and had Naoise and his brothers killed. The king forced Deirdre to marry him, but she later killed herself in protest, ending the tragic story. Deirdre is a name for a beautiful and loving female Wolfhound. It might work particularly well for a fawn, white, or gray Wolfhound. The daughter of Lir, Fionnuala was cursed by her jealous step-mother and she turned into a swan. She and her three brothers who were also turned into swans were doomed to wander for 900 years before a suitor saw through to Fionnuala’s inner beauty and married her, whereupon she and her brothers were turned back into humans once more and her husband was stunned by Fionnuala’s great beauty. Fionnuala would be a cool name for a female Irish Wolfhound with white fur, due to Fionnuala becoming a swan. It would also work for any female who is incredibly dedicated and loving to the children in her human family (like the brothers in her own family). Lir is an Irish god of the sea. He was a jealous and spiteful god. When the head gods got together to pick a new leader for their group, Lir was so furious he wasn’t picked he stormed off and ended up plotting against some of the gods who had voted against him. In the end, this jealousy lost him his four sons as one of his enemies turned them into swans. Lir could be a good name for a gray Wolfhound who looks like he’s coming out of the waves. 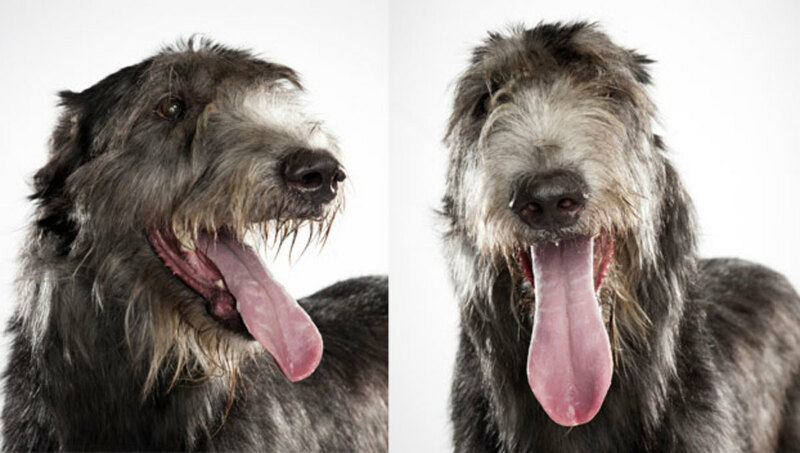 It would also work for an Irish Wolfhound who might get a little jealous at times about tension, food, or toys. 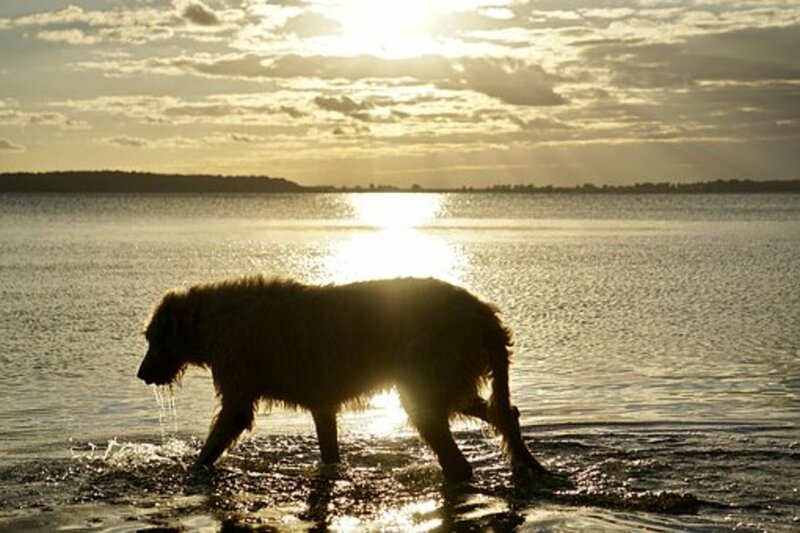 Irish Wolfhound coming out of the sea like Lir. In mythology, Nemain embodies the frenzied havoc of war. She is seen as one third of the tri-part Morrígan. In the Irish epic Tain Bo Cuailnge, Nemain tricks the armies on both sides ensuring increased confusion and slaughter on both sides. In a passage from the book "Breslech Maighe Muirthemhne,” the havoc Nemain can cause during battle is described from the view of the hero Cuchullain. "He saw from him the ardent sparkling of the bright golden weapons over the heads of the four great provinces of Eriu, before the fall of the cloud of evening. Great fury and indignation seized him on seeing them, at the number of his opponents and at the multitude of his enemies. He seized his two spears, and his shield and his sword, and uttered from his throat a warrior's shout, so that sprites, and satyrs, and maniacs of the valley, and the demons of the air responded, terror-stricken by the shout which he had raised on high. And the Nemain confused the army; and the four provinces of Eriu dashed themselves against the points of their own spears and weapons, so that one hundred warriors died of fear and trembling in the middle of the fort and encampment that night." Nemain is a powerful and chaotic force. 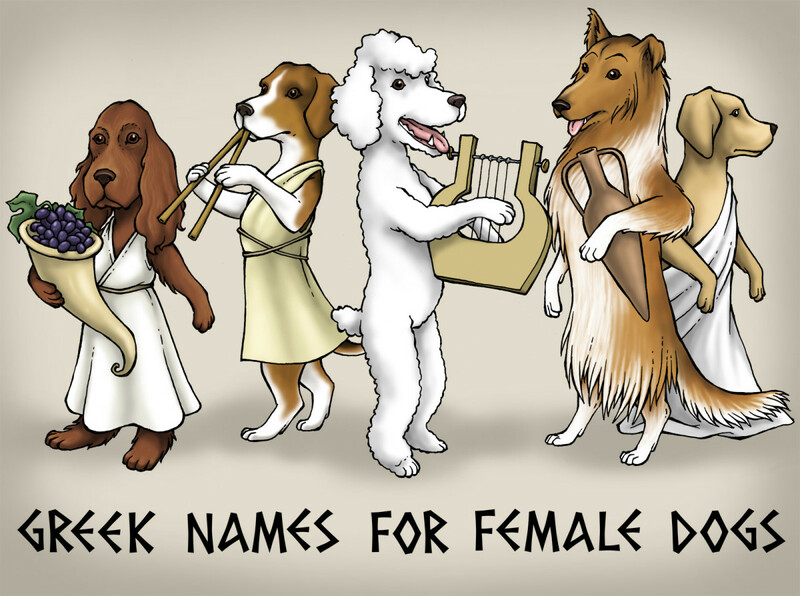 If you have a more mischievous or playful female Irish Wolfhound this name might work. Alternately, this name could work for a Wolfhound puppy that likes to dominate and cause chaos among the other puppies in the litter. Nera was a brave knight among the warriors of Cuachan. It was Samhein evening (or All Hallows Eve). King Ailil decided to offer a prize to his bravest knight. He would give the prize to the knight who would put a wicker band around the angle of a man who had recently been hanged to death. The warriors feared this task due to the fairies, ghosts, and goblins around this night of the year. Nera volunteered for the assignment. When Nera reached the corpse and put the wicker on its ankle, the corpse suddenly animated and demanded a cup of water. Nera took the corpse with him on horseback to a house. The house promptly burst into fire. The pair approached a second house, but it was soon flooded with water, so no luck was to be had there. Finally, they found a third house where they could enter. The corpse drank three cups of water and, with the third cup, spit the remains on the family who lived there, killing them all. Nera sadly took the corpse back to the gallows and then went back to the hall, only to find the hall burning and everyone inside decapitated. Nera thought he saw an army going into the Hill of Cruachan so he followed. There he med a sidhe, or fairy, who told him all he had seen tonight was false, but that it would come true in a year if the men did not destroy this Hill of Cruachan before that time came. Nera heeded the warning. Nera is one of the bravest warriors around. He is a noble being who stands out in the night as a beacon of hope even among the darkness that surrounds him. This name might be good for a white or gray Irish Wolfhound. In legend, Oisín is the greatest poet in Ireland. His name means “young deer” and legend says his mother was actually turned into a deer by a druid. Oisin left Ireland for hundreds of years, but it was said he would die if he touched Irish soil again. Still, Oisín wanted to return, so he was advised to stay always on horseback. Eventually, he touched the ground, and the 300 years he was gone caught up with him in an instant and he died. 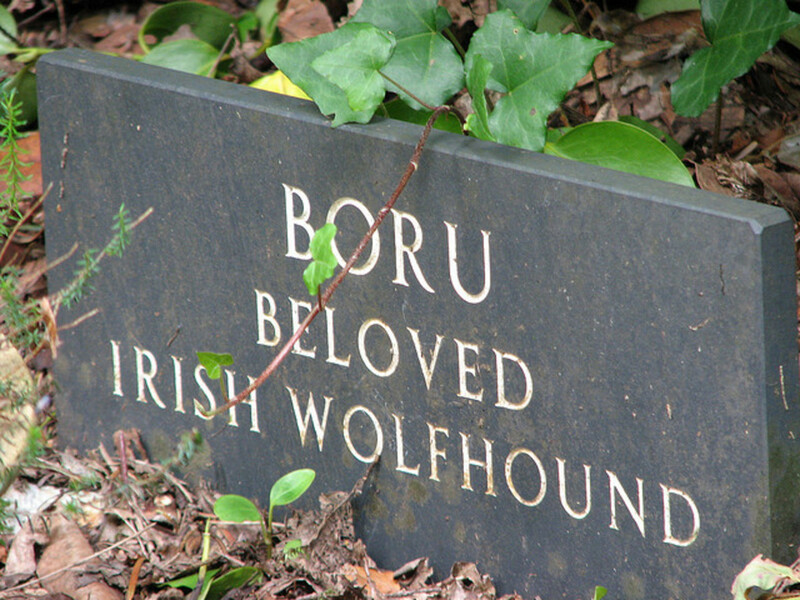 This name would work nicely for a brindle or fawn male Irish Wolfhound, due to Oisín’s association with deer. In Irish myths, Rinnal fought Gennan of the Fir Bolg to become High King of Ireland. People think Rinnal was the first king in Ireland to ever use spears and spearheads. 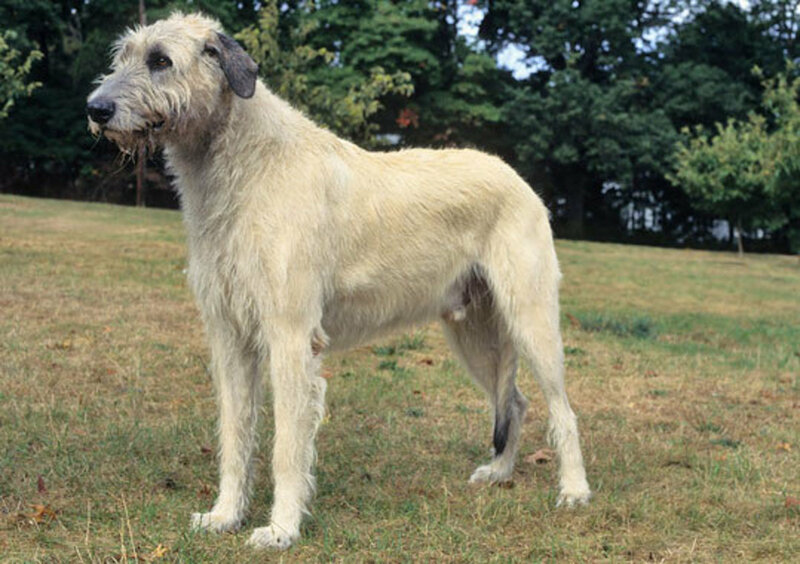 Rinnal is a noble and brave name which would make a noble and brave name for a male Irish Wolfhound. This name might be particularly good for a gray or black Wolfhound since spearheads were often made from flint or obsidian. If you've ever had an Irish wolfhound it kinda makes you want to cry... I mean I'd imagine that it would. That's a great name. I hadn't read that story before. It's an interesting one. Thanks for showing it to me. How about this one, Gelert....ever read the "Story of Gelert?"